The 2017 season has been successfully completed. We are happy and proud - this was another great and exciting year of karting. 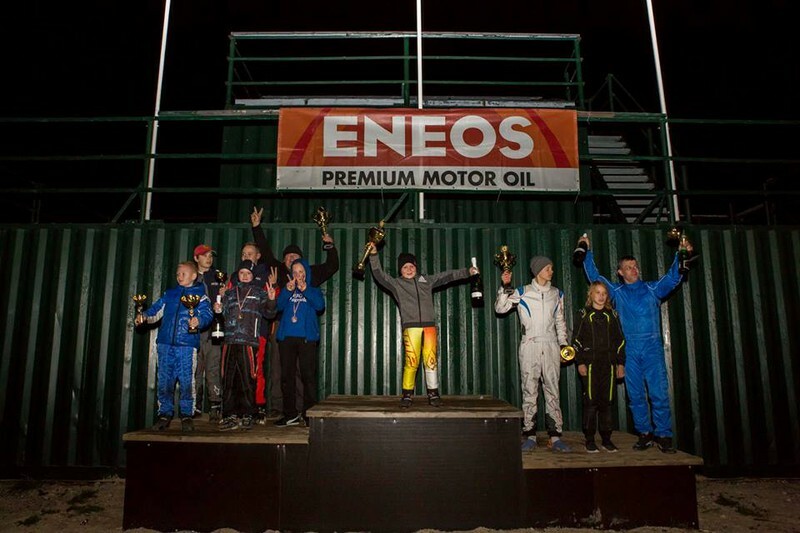 In general, this season we have met 6 Pro-Kart and Latvia Karting Open Championship stages. As well as during the whole season, athletes in Latvia have been able to try out already 5, high-quality and improved karting tracks and, of course, once again we have become acquainted with new and new talents in the auto sports world. In the last race at the start, a total of 200 drivers came in, which exceeds the record for all previous races. All as one, drivers told good words about Smiltenes track and not to dismiss that it is nice to finally race on the track, which nobody really got to know, thus placing all the athletes in a more equitable position. Also, undeniably, the racetrack, elbows and trajectories are very interesting. In general, the race was held without serious incidents, but, of course, without them, it would not be complete. Several times during the pre-finale, due to various classes, the track had red flags, which meant that the schedule delayed by 50 minutes. In order to make the competition day in time, it was decided to reduce the number of laps in each class by 4 laps in the finals. 3rd place - Roberts Purmalis. 3rd place - Alexander Abkhazava. 3rd place - Johann Vain. 3rd place - Mārtiņš Steinerts. 1st place - Juris Zālītis. 3rd place - Kristiāns Rihters. 3rd Place - Hugo Arendi. 3rd place - Kristers Linde. 3rd place - Andis Feldmanis. 3rd place - Sandis Eislers. 3rd place - Armands Andersons. 3rd place - Jon-Einari Bambus. 3rd place - Ēriks Gasparovičs. 3rd place - Mark Villem Moor. 3rd place - Markus Ryytli. 3rd place - Markus Soste. 3rd place - Edgars Pavārs. 3rd place - Denis Kiseļņikovs. 3rd place - Rytis Gumauskas. 3rd place - Māris Aizsils. 3rd place - Henrijs Jaunslavietis. These are definitely not the end but a pretty ending for another karting season. But this year we will meet at least once more and this will be on December 2 at the prize giving ceremony in Aizkraukle Culture House. We invite everyone to book this date on their calendars, as further details will follow. Thank you to all athletes, teams and supporters for fantastic emotions throughout the season. We will meet you on the track in next spring! Invite to SourcingIC.com as well as we are seeking your RFQ or Bom Listing for us to estimate. I know you might require to locate ICs. The major goal for us is sourcing ICs. As you know more than 99% ICs readily available in this earth could be located in China, yet it is time-costly to locate or send out queries to thousands of distributors or firms one by one to discover who got supplies as well as get great quotation! Action 2: Inform us component number as well as the quantity or various other demands. Step 3: I will certainly resource from vendors as well as our colleague will certainly choose the dependable provider to price quote. Step 4: Our skilled IC technicans will test the ICs to validate they are brilliant and also functioning well. Tip 5: Well packed as well as delivered. To provide every rare ICs. Souring IC Ltd is a Hong Kong based firm with China offices in various provinces. We supply a vast array of electronic elements, focused on IC consisting of Audio IC, Power Management IC, Customer Electronic IC, and so on. Our purpose is to provide any type of components which are challenging to be sourced in the digital market, especially the one discountinued by manufacturing facilities. With the aid of most recent A.I system as well as the elite colleagues we had, we have the ability to resource every ICs that is not typically utilized by the co-operation with thousands factories as well as agencies in China. We are able to provide one of the most affordable cost without MOQ. Of Events With The Click Of 3 Buttons! This is Leo from Hong Kong, we are manufacturer focusing on 7 in 1 Thunderbolt 3 USB3.1 Kind C to CENTER Adapter just. 7in1 Adapter is basic and hassle-free, promptly converts any kind of Type-C Thunderbolt 3 USB-C port, HUB Port for 4k video clips, 1 DATA-ONLY USB-C port, 2 x USB 3.0 Ports, as well as SD/Micro card viewers. • Take advantage of the USB-C port on your laptop computer or Ultrabook ™ to increase your connectivity to various other user interfaces, such as HDMI and Gigabit Ethernet. • Attach your laptop to a projector and also take pleasure in multimedia content in the house, or display interesting discussions in classrooms as well as boardrooms. • Make use of an HDMI port-equipped television in a resort room as an external screen when taking a trip. WiFi Display HD TV Screen Mirroring TV Wireless Dongle For Google Chromecast 2 For Netflix YouTube Crome Chrome Cast Cromecast. Fully Support Netflix, Youtube, Google and other games videos movies sites. For IOS / Android / Windows are operating in the same mode, no need to switch mode, easier to use than before. With HDMI Full HD 1080P output with faster processing speed offers you a perfect home theater experience. Miracast / DLNA / Airplay / Airplay Mirroring, Design for home theater, PPT presentation, Game and video meeting. No App or Driver required, only 3 steps to enjoy the media on large screen: Plug->Connect->Mirroring. Please following the step listed in images correctly, or it will not work. Built-in WiFi module supports 2.4GHz WiFi, supporting Online & Local content wireless display: Video / Audio / Photo / Office file / Website. If dongle is on network mode, it will upgrade automatically when there is a new version on the dongle server. MKV, WMV / VC-1 SP / MP/ AP, MPG, MPEG, DAT, AVI, MOV, ISO, MP4, RM, H.265, Real Video 8 / 9 /1 0, Up to 1080P. MP1 / MP2 / MP3 / WMA / OGG / ADPCM-WAV / PCM-WAV / AAC. If you have any questions about this product, please contact us immediately, we will give you a satisfactory solution. Please dno't inform us in such a way as to open a dispute and give us negative feedback, because we can't receive your feedback in time.